All Laurel wanted to do was go sledding in the snow and we were unable to find a suitable spot on Saturday, so that was our main goal for our last day in the park. For us, we got an early start and were out of the room by 11am. After a short drive, we were at the crowded parking area with the man selling snow chains. We got lucky and didn't have to wait long for a spot to open up. I was very tempted to pay another $40 to have the chains installed, but I knew I had to learn myself. I decided to give it a try. Even though it took far longer than the three minutes it took the professional, I was able to get them on without too much cursing. We found the roads to be in a similar condition as the previous day, mostly ice surrounded by high snow drifts. There seemed to be a lot more vehicles on the park roads. Maybe word had gotten out that the roads were open and the waterfalls had very high flow rates. Between the ice and traffic, the pace was frustratingly slow, especially around the more scenic spots. 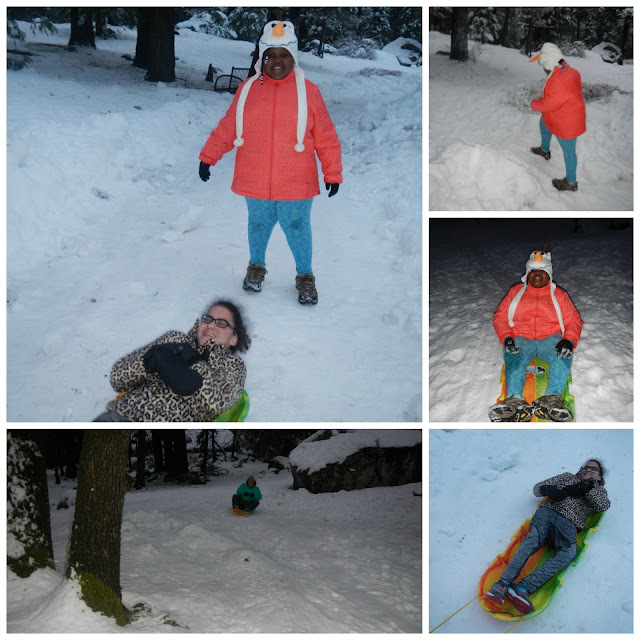 Since we didn't find any good sledding hills in the valley, we decided to check out a different area of Yosemite. We decided to turn off and head up to Inspiration Point. The road was steep and nothing but curve after curve as we gained elevation through the forested mountainside with several feet of snow on the ground. The parking area for Inspiration Point appeared quickly and we pulled immediately into a disabled parking spot with a breathtaking birds-eye view of Yosemite Valley from El Capitan to Half Dome and beyond. After taking in the view for awhile, we decided to continue on the road further into the mountains. This proved to be a bad decision. Almost immediately we were stopped due to a family minivan that slid off the road into some trees. The mother and father with two small children appeared to be uninjured and rangers were on the scene in a matter of minutes. The road was too narrow and icy to attempt any kind of u-turn or 3-point-turn, so we just crept along with everyone else. Once past the accident, the traffic did not open up at all. At one point we were stopped for approximately 10 minutes. I was amazed at all the cars descending the mountain without snow chains. After close to an hour and probably a half mile higher on the mountain, we came upon a second accident. This time it was a car that slid into a rock wall. We continued until we could turn around. Even with chains and the slow pace, it just didn't seem safe to be on such a narrow, icy, and steep mountainous road with so many ill-equipped drivers. We eventually reached an intersection to a ski area that was closed due to too much snow? We all benefited from the park's restroom at this point and used the parking lot as our turn around. We were hoping the two accidents would be clear by the time we made our way back down the mountain and they were, but there was a new accident to be negotiated. The views were impressive, but probably not worth the risk or time it took for our little side trip. Plus, we weren't able to find a good sledding hill. With a fading sun, we were ready to leave the valley when Lisa noticed a few people sledding off in the trees on her side of the car. I passed the parking area, but soon found a safe place to turn around. It's as if they knew we were on our way, only one spot was open and it was a disabled spot. We don't just jump out of the car and go sledding, there's a process of getting both girls bundled up for the cold and Kellisa gets so excited it's very hard to get her arms through jacket sleeves, not to mention getting a hat on her head and gloves over her hands. I was sweating before we even started. Lisa and Laurel took one sled up the small hill and began their adventure while I pulled Kellisa along a flat path at the bottom. Kellisa was giggling as we raced and spun around. Up above, I could see my other two girls having fun. Kellisa would love sledding down a hill, but she's just as happy on a vertical surface making my life a little easier. By the time all three girls we tired and ready to warm up in the car, I was too tired myself to try sledding. We can't wait to return in the summer! In fact, we secured a campsite for four nights in July the exact second (7am Pacific Time on 2/15) they went on sale. We got lucky since all the campsites sellout literally the second they go on sale because there are more people clicking "Check Availability" than there are campsites by many times.